i was wandering around the farmer’s market last week, thinking about how i’d written about so many different foods that what else could i experiment, and then i saw some rutabagas and realized i’ve never even had one. from what i’ve read, these weren’t the finest examples [the best advice is to pick smooth, unblemished roots, and the ones i found had cracked ridges around the tops], but i thought i’d take them home and do a little experimenting. i can see why they’re only preferred in desperate, world war famine times. they’re sort of neither here nor there, and often served in a group with a selection of other root vegetables. one reason may be its natural bitterness which comes out with cooking. i decided to try my hand at baking my own root vegetable chips, and while sweet potatoes and beets turned out nicely, rutabagas are not a good choice for this. this brought me back around to eating them raw, which is quite nice. they’re crunchy, lightly sweet, full of fiber, and taste fine on their own or with your favorite dressing or dip. 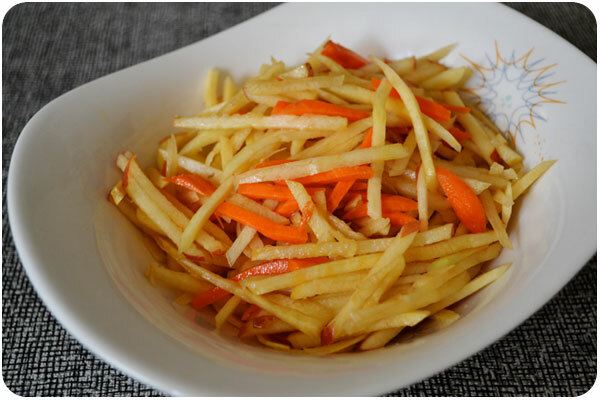 since i love shredded salads, i thought the taste would work well with some carrots and apples, and a light vinaigrette. break out your julienne mandoline [or super chef knife skills] and shred up the rutabaga, carrot and apple into a mixing bowl. prepare your favorite vinaigrette, or use the one i suggested [i’m way into this roasted walnut oil lately] and drizzle it over the top. mix well to coat, season with salt & pepper and enjoy!